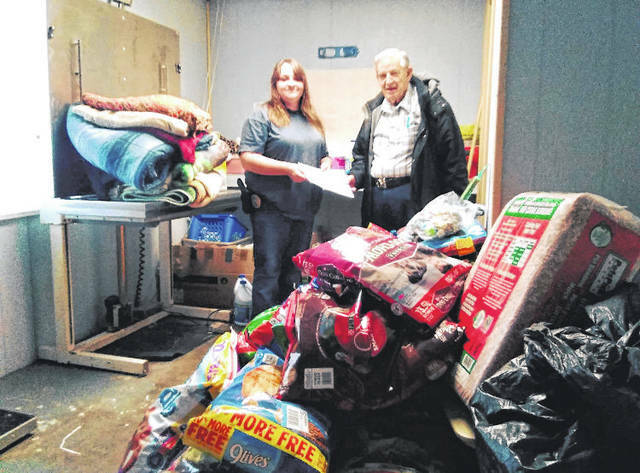 John McDermitt pictured with Mason County Dog Warden Jessi Hall and the donations from the Mason County Animal Shelter’s charity bingo night. 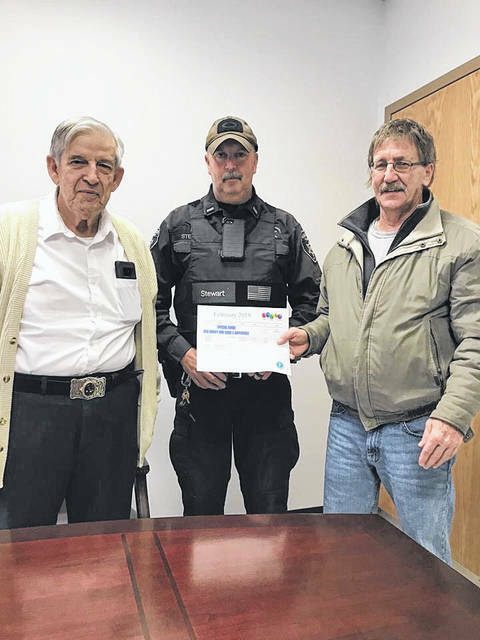 John McDermitt, DARE Officer Troy Stewart, and Dave Morgan pictured with the Point Pleasant Moose Lodge’s February bingo calendar. POINT PLEASANT — A local organization has been opening its doors on the second Monday of each month for special charity bingo nights. Since the start of the new year, the Point Pleasant Moose Lodge 731 has hosted a charity bingo event for the Mason County Animal Shelter and already have two other charity bingo nights planned for February and March. For the animal shelter, over $2,500 was raised worth of the bingo night’s proceeds along with the donated supplies shared Dave Morgan, lodge member and charity bingo volunteer. On Monday, Feb. 11, a charity bingo night will be held in support of the county’s DARE program for the youth. The doors of the lodge will open at 5 p.m., with the games starting at 7 p.m. Admission is free and there will be a 50/50 drawing. The games offered for the evening are four coverall games which cost $5 a piece and 10 regular games which cost $1 a piece. Morgan added tee-shirts will also be offered as prizes. John McDermitt, lodge member and charity bingo organizer, shared bingo nights are open to the public and they are a family event. Though an individual must be 18 years old to play bingo, youth under that age are still allowed to attend. No alcohol is allowed inside the lodge doors during bingo and concessions are available for purchase. During charity bingo nights, all of the proceeds raised from the bingo games, 50/50 drawing, and concessions all go towards that night’s charity. Mason County Sheriff Greg Powers shared DARE Office Troy Stewart has been in charge of Mason County’s DARE program for Mason County fifth graders for nine years. He commented approximately 380 children graduated from the program last year and they are on a similar track for graduation this year. Most of what is done for the DARE program is done through donation and majority of the proceeds raised for the program during this charity bingo night will be going towards the DARE graduation. The graduation will be held at the Mason County Board of Education office this spring and the day is a reward for the children in the program, a bounce house is provided on site each year as well as snow cones and other activites. Stewart added DARE programs have freedom. He explained for his students in Mason County he touches on the subjects of the opioid crisis as well as energy drink and vaping usage in the youth among the other staple prevention subjects. Stewart breaks down what each drug and/or substance is and what it does to the human body. Powers shared though the majority of the proceeds raised will be going towards the DARE program, a small portion may also go towards a new K-9 vest. When the lodge members first started opening their doors for charity events, they would host blood drives on Monday nights explained Morgan, then they started holding events for local organizations, programs, schools, or individuals in need. He shared the members take a vote on which entity within the community to help and recommendations can be given as well. In March, the lodge will be holding a charity bingo night for the Mason County Homeless Shelter. Morgan shared the turnout for the first charity bingo night of the year produced an above normal attendance and he hopes to see more people come out for the upcoming charity bingo nights.